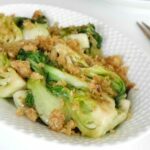 This low carb baby bok choy side dish has a wonderful crunchy topping and delicious Asian flavors! 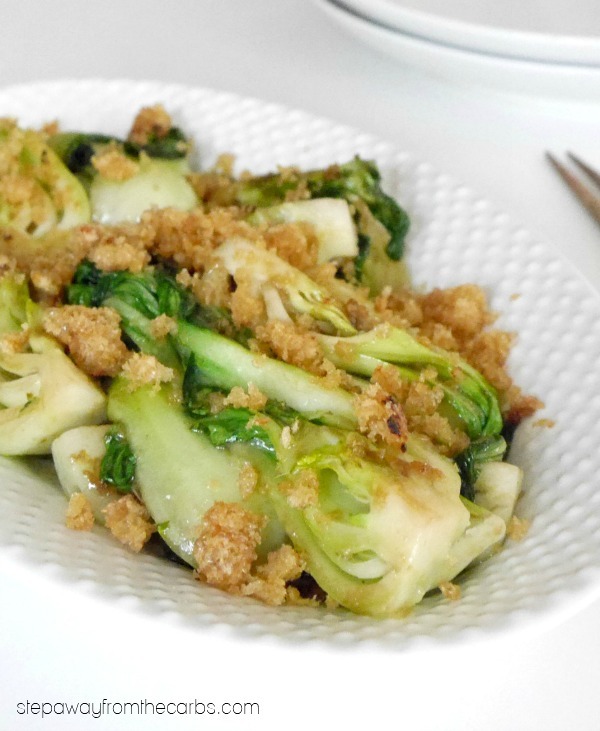 If you’re looking for an easy side dish with Asian flavors like ginger and soy – take a look at this recipe! The crunchy topping here is made from crushed up pork rinds (or chicharrones, or pork skins, if you prefer to call them that!) that have been toasted with garlic. I’ll admit that pork rinds are not a traditional Asian ingredient but it really does add a wonderful textural contrast to the bok choy. You could substitute something like breadcrumbs or panko if you wanted to keep the dish vegetarian, but then of course the carb count would increase. Prepare the crunchy topping by crushing the pork rinds – I usually just place a handful in a bag, close it, and bash it around a bit. Heat some oil in a skillet and add garlic paste or minced garlic. Add the crushed pork rinds and cook over a medium heat for 5 minutes, stirring frequently. Set the topping aside and return the pan to the heat. Refresh it with more oil, and add some ginger paste (yes, I love my convenient seasoning pastes!). Cut the baby bok choy into quarters and add them to the skillet. Cook for 5-6 minutes until the stalks are just heated through and the leaves have wilted. Drizzle over some soy sauce, stir, then transfer the bok choy to a serving plate. Scatter over the topping and serve! Heat some oil in a skillet and add the garlic. Add the crushed pork rinds and cook over a medium heat for 5 minutes, stirring frequently. Set the topping aside and return the pan to the heat. Refresh it with more oil, and add the ginger paste and baby bok choy. Cook for 5-6 minutes until the stalks are just heated through and the leaves have wilted. Drizzle over the soy sauce, stir, then transfer the bok choy to a serving plate. Scatter the topping over the vegetables and serve! Sounds really good & I don’t think I’ve made bok choy before. I think I could use coconut aminos in place of the soy and give it a go! Thanks, I need more veggie sides in my rotation. My family is bored with my spinach salad side. Oh, yum! I have been on a ginger kick recently and admittedly don’t prepare Asian vegetables enough. Looking forward to try. I love your casual note to “bash it around” to crush the pork rinds. You make me laugh. That looks like it could be my lunch tomorrow… with a bit of sea bass maybe? Ooooh yes that would be perfect! Delicious! I was just thinking about low carb Asian food last night! Thanks for the new recipe! This looks delicious! Love that you added the crunchy topping!